Between 1943 and 1945 Universal plugged their contracted star Lon Chaney Jr into a series of six low-budget mystery-horror films based on the popular 1940s Inner Sanctum radio show. The translation to film seemed an obvious one as the original radio version starred many notable horror actors of the era, such as Boris Karloff, who played in more than 15 of them, Bela Lugosi, Peter Lorre, Claude Rains, Orson Welles – even a very young Frank Sinatra. These eerie, modest little suspense tales were ideally suited to the B-movie format, each beginning with a darkly humorous introduction from the host Spirit of the Inner Sanctum - Raymond Edward Johnson in the radio version and an uncredited David Hoffman in the films. Weird Woman (1944), the second of the film run, is an amiable time-passer with an unusually strong, female-centric cast. It was directed by Reginald Le Borg who later that year would direct Chaney again in The Mummy’s Ghost. The script by Scott Darling and Brenda Weisberg was adapted from Fritz Leiber’s novel Conjure Wife about a supernaturally sceptical college professor in a town of practising witches. Upon discovering his wife is one of them, he persuades her to burn her occult trinkets. which then dramatically turns his luck for the worst. The couple are thus rendered vulnerable to the opposing witches’ demonic powers. how sociology Professor Norman Reed meets his wife and the depth of scheming amongst the wives of academia that doesn’t need witchcraft’s assistance. 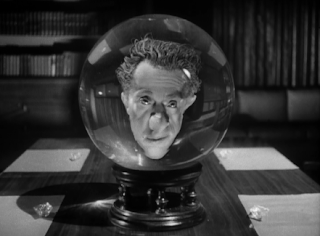 Hoffman’s distorted face in a crystal ball introduces the tale, underscored by a sinister organ, as he warns the audience that “Even you…without knowing…can commit murder”. Chaney is a somewhat unlikely casting as the “mental giant” academic Professor Reed, sporting a distinguished moustache to offset the blue-collar connotations. To give him some suggestion of depth, his role is saddled with a tediously repeated device of an inner monologue delivered in an intimate whispered tone. This kicks in straight away as Reed begins to obsess privately about his new wife Paula (Anne Gwynne) who seems to be going walkabout in the night without telling him. Gwynne had already featured in the occult-flavoured horrors Black Friday (1940) and The Black Cat (1941). Here, a flashback shows us that she is the product of an upbringing by a cult High Priestess in the South Pacific when the pith-helmeted prof meets her. By improbable coincidence she happens to be the daughter of a professor who taught Reed. Reed whisks her away from camp-fire tribal frugging, beads and ju-ju into the more clandestinely sinister world of modern American college politics. There is stiff competition on campus for the new sociology chairmanship post and Reed is being considered opposite Professor Millard Sawtelle (Ralph Morgan). Sawtelle harbours the guilty secret that his published book on South Pacific island practises plagiarised a student’s unpublished thesis. He daren’t tell Evelyn, his nakedly ambitious Lady Macbeth of a wife (Elizabeth Russell, she of the exotic high cheekbones and mystery from the Cat People films). Meanwhile, there is even more competition for the position of Queen Bee of dastardly plotting amongst the ladies. Evelyn Ankers’ Ilona Carr watches with barely-disguised jealous venom as Reed brings home his island bride. He and Ilona had enjoyed what he thought was a “pleasant flirtation”. Jilted, she opts for upgrading her designs on him by any means necessary. 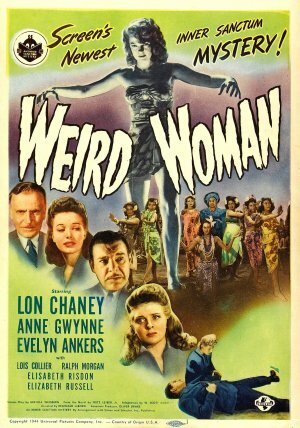 This was Ankers’ fourth movie partnered with Chaney after The Wolf Man (1941), The Ghost of Frankenstein (1942) and Son of Dracula (1943) and her aggressor role makes a refreshing change after being more passive glamorous victims. If two isn’t enough, another femme fatale is waiting in the wings to ensnare Reed. Margaret (Lois Collier) is a calculating young student eager to assist him extra-carricularly, much to the frustration of her spurned boyfriend David Jennings (Phil Brown). This is the other invigorating change for a 1940’s horror film where the three conniving women (practically a coven) - plus Paula – drive the plot twists, leaving the men eclipsed and on the back foot of reeling from their machinations. Despite her uncivilised raising on an island of primitive witchcraft, Paula is shrewd enough to sense Ilona and Evelyn’s deviousness behind her husband’s back. Instead of heeding her, Reed refuses to open his mind to her beliefs. When he discovers her nocturnal ramblings were to a churchyard to perform rituals for his protection, he convinces her to burn her occult props. (He is after all the newly-celebrated author of ‘Superstition Vs Reason and Fact’). As we saw from the novel, this plunges the Reeds into a nightmare of deadly conspiracy. “You left us at the mercy of evils”, Paula tells him. No sooner has Paula’s talisman been toasted, Ilona kills Evelyn’s husband and attempts to pin the blame on Reed. The homicidally jealous David confronts Reed in the gym with a gun and accidentally shoots himself. As the forces of multiple women scorned close in on him, Chaney plays to his strength, that of the haunted victim of the supernatural. 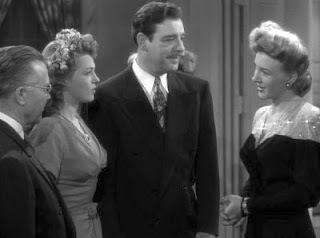 Elsewhere the actor rather than the character appears awkward and stiff when trying to challenge the devilish ladies. Almost literally at the eleventh hour, Evelyn develops a conscience about mistakenly accusing Reed of killing Sawtelle and turns the tables upon Ilona. She plants a voodoo doll at Ilona’s home, sowing the seeds of fear in her that ultimately drive Ilona to fall through a greenhouse, hanging herself from the vines at a prophesied minute past midnight. 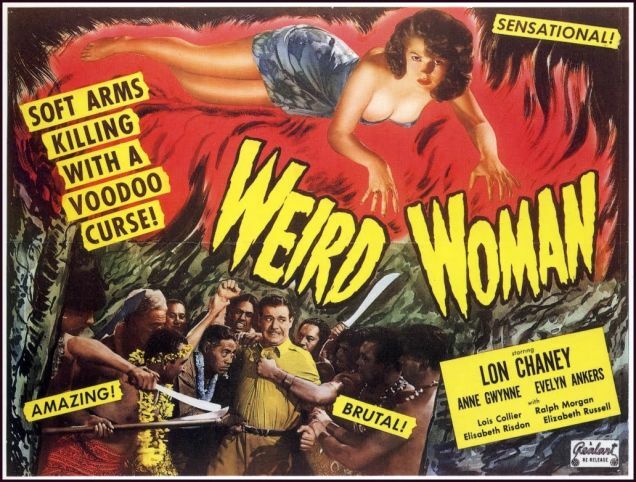 To its credit, Weird Woman demonstrates that classic era horror films benefitted from creating active, interesting parts for their female cast rather than constantly reducing them to imperilled decorative baubles. Unfortunately, the B-movie was usually too far under the radar to impact on the rest of the industry..